Toddlers grow at different rates and have different levels of physical activity, so portion sizes for this age group are not exact. The best way to judge how much food your toddler needs is to pay attention when they are showing signs that they are hungry or have eaten enough. Trust your toddler to know when they are hungry and when they are full. If you provide regular, relaxed meals they should be able to properly control how much they eat. Help your toddler serve themselves, but don’t overfill their plate. Offer a small second serving if needed. 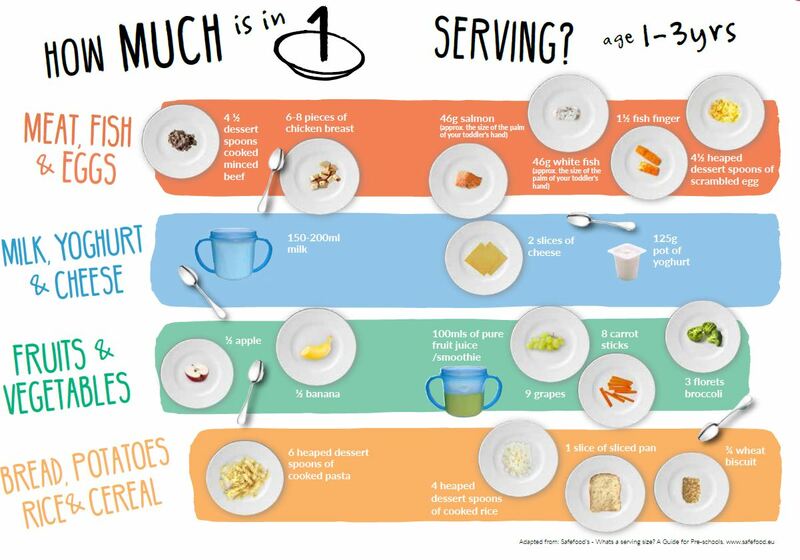 The chart shows the amounts of food a toddler can eat at meals. Bigger and more active toddlers might need a little more, and smaller toddlers may need less.